If you wish to add your name to the 2018 holiday, please contact us. Ideal location with Ski-in, ski-out location at the foot of a green slope, next to the chairlift . Hotel Terra Nova: This is described as full board, in practice it includes a packed lunch which you can eat in or out, normally we elected to regroup for lunch together in the Hotel Bar or veranda. “The Terra Nova has a superb location in Plagne Centre at the foot of the pistes so you can ski back to the door and in the morning the chairlift is just on your doorstep. You can be assured of a high quality, friendly service in a fantastic location. 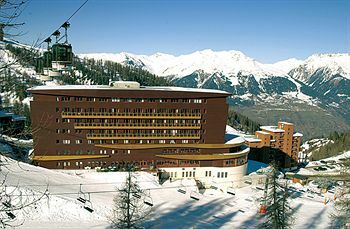 All meals are served in the hotel’s panoramic restaurant with fantastic views of the slopes. The hotel offers an excellent range of rooms making it a good family option with both quad and interconnecting rooms available”.